Taste test: These conventional potato chips were crisp and had some very intense spices on them. There was plenty of flavor, sort of tomatoey but also spicy, really nice and kind of hot. 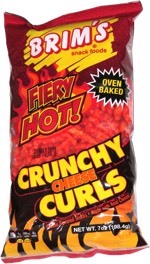 After finishing the chip, there was a hot aftertaste that lingered for just a little while. Good stuff! Smell test: Wow, very spicy smell. 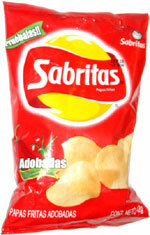 This snack was discovered by Nancy in Mexico. Review published .